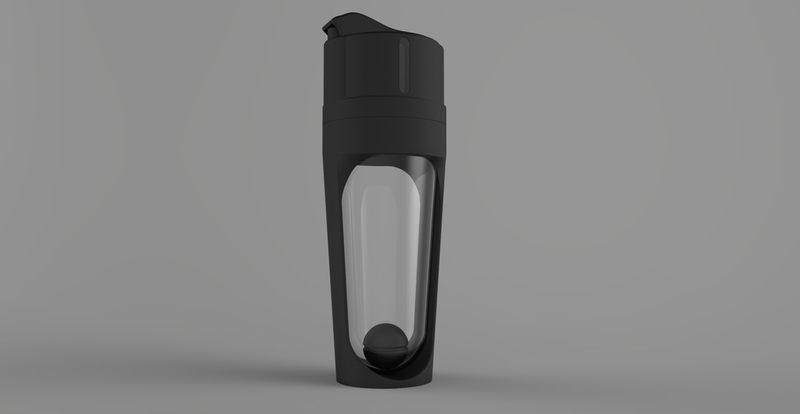 Enfuse is the third and final design iteration of the protein shaker with integrated supplement storage. Enfuse is effortless to clean due to the curved tempered glass bottle design. It is protected against drops by the smooth silicone casing, and this combination of materials provides compelling contrast. The whisk design has gone minimalist, to avoid material getting caught in the grooves that were found on older iterations. A clear window has been added to the lid to show how much supplement is loaded. Furthermore, haptic feedback has been added to the now two-stage release mechanism that is also integrated into the spout. The spout is spill-proof with a sprung slider that acts in a click-pen fashion. One click opens the spout, a second closes it. Pushing the slider all the way to the back releases the supplement. Not only has the attention to aesthetic detail been maximized in this iteration, but the haptic feedback provides the user with a reassuring experience. The purpose of this design study was to show that UX is just as important in physical products as in web interfaces - and that a product with great UX can also look great!